I moved house at the beginning of January, and setting up the new place took up a fair amount of time, as did going through the process of installing Windows 7 on my computer! 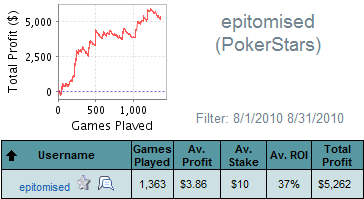 Consequently I played very little poker; only 4 days worth towards the end of the month. 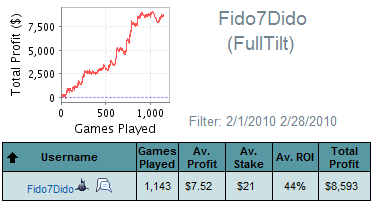 However, I start coaching for CollinMoshman.com, including taking on Ray 'mondonewc' Norton who ended up doing really well. 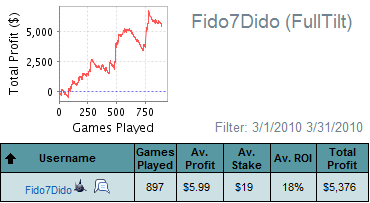 After playing predominantly on PokerStars (where my screenname is epitomised) for the previous 7-8 months, I decided to give the games on Full Tilt a try (where I was playing as Fido7Dido). 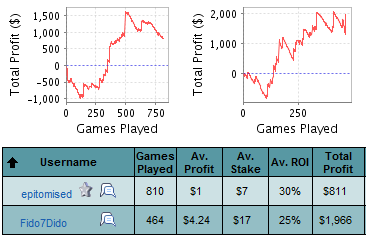 This experiment went rather well, and February turned out to be my most profitable month of the year. Another solid month at the 45 and 90-mans on Full Tilt. Went on a mate's stag do in Newcastle that was fairly messy, but good fun. I had six students under my wing at this point, and wrote an article about poker coaching for PokerNews. My results were quite swingy in April, and I was really not happy with my work ethic (or lack thereof). It turned out to be a pretty 'meh' month, which included me busting pretty early in the UKIPT event in Coventry after getting my money in good. 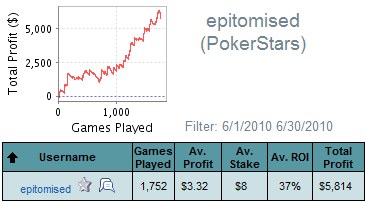 After my results and volume on Full Tilt really tailed off, I decided to move over to PokerStars. 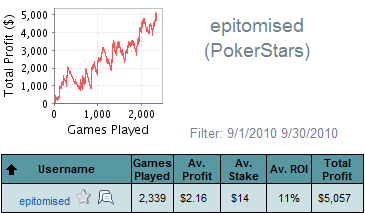 With much sleeker software and no cap on the number of tables you play, it feels like you can work harder on Stars, and I think that hard work can motivate you to work harder if that makes sense. After swapping between the sites a few times over the last year, I decided to commit myself to PokerStars by aiming for Supernova. It was also to encourage volume, as it would require a lot of days work to get there playing the 180-mans that I was at the time. I created the 'Supernova Quest' to encourage me to blog more after my quantity of blog posts had tailed off too. 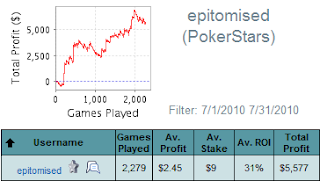 Had good results in my first full month back on PokerStars. I discovered that video blogging was very time consuming if you have to do any form of editing (the main reason for the lack of video blogs since!). Was pretty jealous of the Brits' success at the World Series of Poker after I missed out on going myself for the 3rd year running. Another solid month results wise, although I actually ended my Supernova Quest because I didn't want it to detract from me making profit in the games. I did have approximately a £10k epic downswing towards the end of the month...when me and my fiancé booked our wedding. Actually, I had proposed on Christmas Day last year, so perhaps the downswing can be ascribed to 2009 instead! I went away with the inlaws on the least balla holiday ever, a 'staycation' I think it's been dubbed recently. Although I enjoyed the time away from the computer and with the family, lets just say I won't be going back there anytime soon. This contributed to my volume being a bit down for August, but things were still going well at the tables. I decided to finish up with coaching so that I could concentrate more on just playing myself. Personal event: Went on holiday with the in-laws! 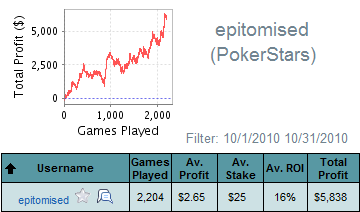 I had really bad conjunctivitis in my left eye for most of September, which really sucked, as it was kind of worrying and also because it was too uncomfortable to put in poker sessions where I'd be staring at my computer screen for hours on end. Multiple trips to doctors and optometrists ensued, and eventually some drops with steroids worked, but I still wake up with my left eye all blurry every morning and it gets a little bloodshot quite easily. 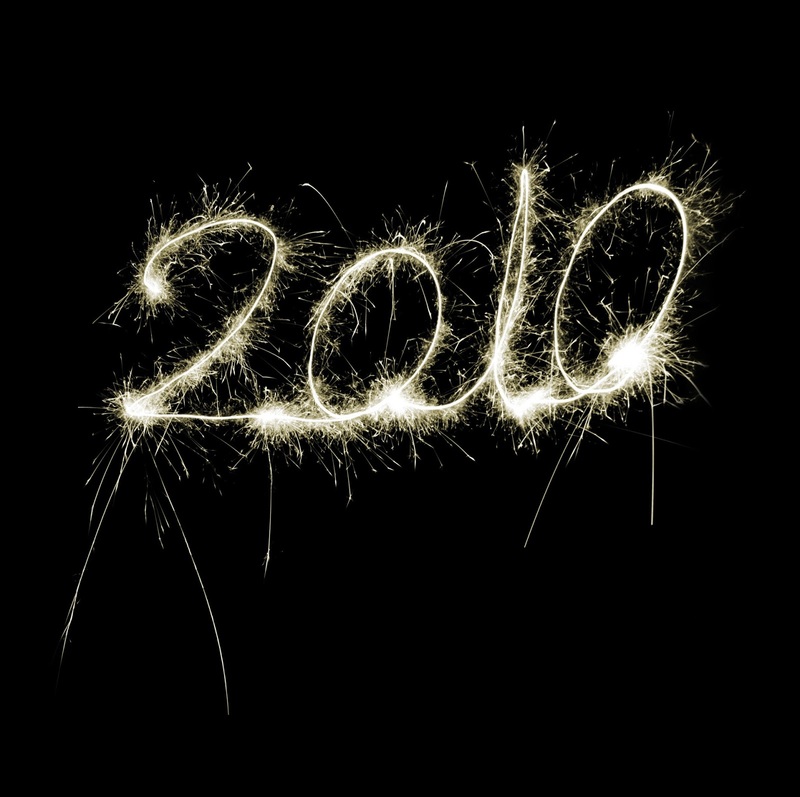 I really hope it doesn't recur in 2011! I made the transition from 180-man SNGs to 18-man SNGs sometime in October. 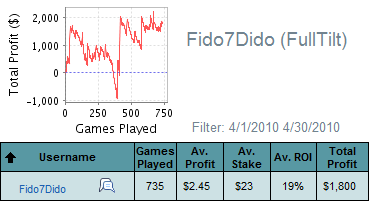 I was getting tired of the night-time schedule that playing 180-mans in peak time entailed, and moving to 18-mans allowed me to play during the daytime. They would also help me get to Supernova by the end of the year, which encouraged me to reinstate my 'Supernova Quest'. I also wrote an article about needbeer breaking the VPP record on PokerStars which drove the most traffic to my blog of anything I've written so far (perhaps I should stop writing about me and concentrate on other people!). Last month of the year turned out to be a bit of an epic fail. 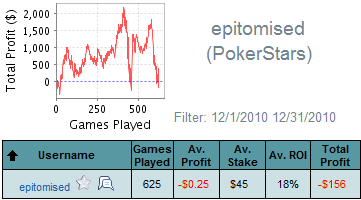 I put in no volume, donked around in MTTs, got no-where in a couple of live events and took the last two weeks off for Christmas/to refresh before I start uber-grinding on January 1st. Having said that I did make Supernova for the very first time, and had a good Christmas break, so there were some good things to take out of it. 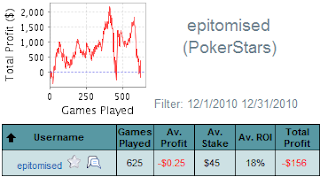 This was without question my most consistent year of poker, effectively not having a losing month, and mostly having very good results in the months I grinded properly in. 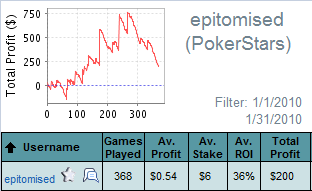 My results were very solid across the board, despite mixing up the format I was playing a little too often. 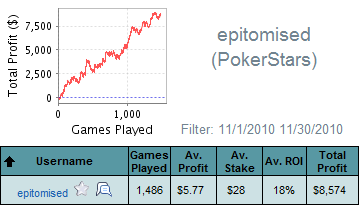 I'm pleased I decided to commit myself to PokerStars and make Supernova, and I think the switch to 18-mans will prove to be a good decision next year. Although my results were good, at many points in the year I was not happy with the volume I was putting in, nor the daily routine I was keeping. I plan to fix both of those things next year and hopefully have an even better year than this one. On a different note, I am pleased with the work I put into my blog this year, I'm always making tweaks here and there, and my daily hits are gradually increasing. Thanks to everyone who takes the time out to read my blog, and best wishes for 2011. 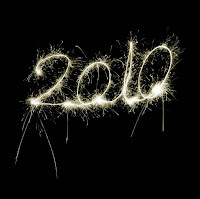 3 Comments to "2010 in review"
Get part 2 up sir! Oh and congrats on reaching SuperNova! Hi sir , nice blog . want to share links ?